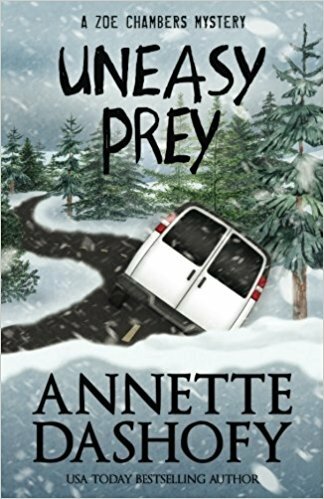 I’ve enjoyed this series by Annette Dashofy. 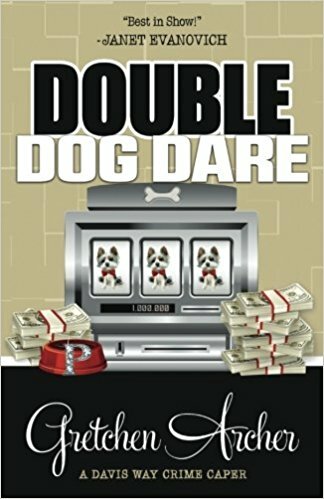 In this book (which is the sixth in the series), paramedic and deputy coroner, Zoe Chambers, is once again in the thick of a murder mystery. There is someone preying on the elderly in their town. They are posing as water department employees and are busy casing homes for burglaries. After a woman dies, the hunt is on. Zoe’s boyfriend, Police Chief, Pete Adams, is called in and is busy hunting down the murderers. Zoe gets in involved when her elderly friend appears to be the next target. 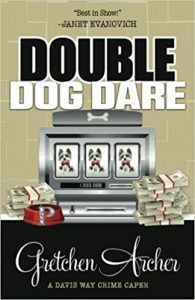 Zoe moves in to help keep both Mr. and Mrs. Kroll safe from the unscrupulous criminals. With Zoe now in danger as well, Peter goes into overdrive to keep both Zoe and the elderly in their town safe. 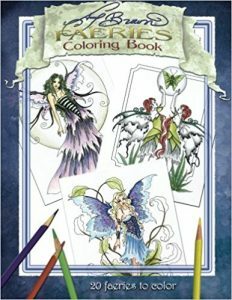 I own a couple of coloring books by Amy Brown. 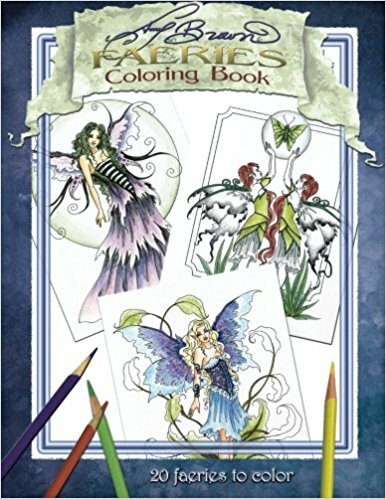 She has a unique style and look to her faeries that is really fun to color. I was really pleased to see that other of her older and out of print books are being re-printed once again. 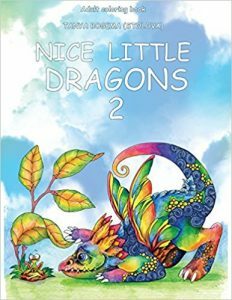 This is the second book in her series of Faeries. The designs has some detailed elements but are, for the most part, open and easy to color. I like the sense of movement I feel when I am coloring one of Ms. Brown’s designs. There is always a feeling of flow and grace to her lovely creatures. 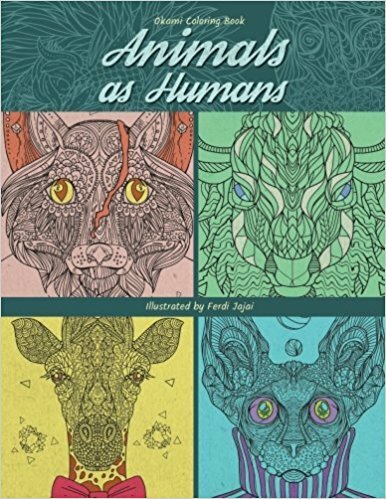 Based on the title of this coloring book, I had hoped to see animals in human clothing doing things that humans would do. What the book actually contains are 40 designs of animal heads with collars which are based on human clothing. The animals have the structure of the real animal but are filled with intricate doodles designs. While the animals are detailed, the clothing is not and in some cases are merely a few lines to suggest the top. 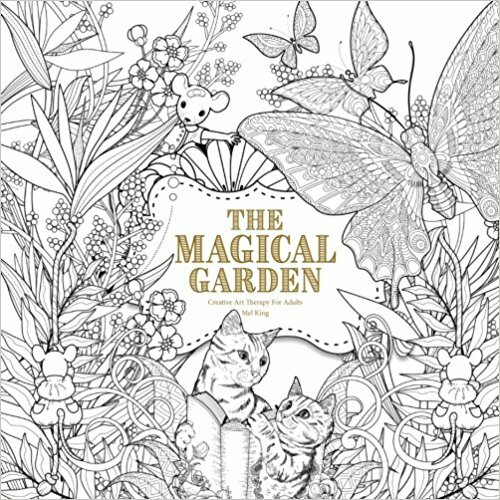 As the designs are extremely intricate because of the doodles, I don’t suggest this as a coloring book for anyone who has vision or fine motor issues. While it is a little too detailed for me, for those who like to use a lot of different colors, this presents a nice set of designs which have a lot of detail for that purpose. I always look forward to a new Davis Way crime caper. I’ve been following the series for a while (have to go back and find the time to read the first couple of books that I missed.) It is one of my favorite series as the plots are hilarious and the characters sometimes bring tears to my eyes from laughing so hard. Davis Way Cole is responsible (part time now that she has the kids) for security at the Bellissimo Resort and Casino in Biloxi, Mississippi. She lives there with her husband (manager of the Casino) and their young twin daughters, taking up half of the 29th floor of the hotel. A continuing theme in the books is that Davis is a dead ringer for the casino owners wife, a pampered lady who prefers to have Davis double for her at local events and has, for some reason, decided that Davis’ name is actually David. “The Magical Garden” is a smaller format book (8.5 x 8.5 inches.) The designs are extremely detailed with many small and intricate spots to color. The designs are inspired by plants and animals in a garden setting. 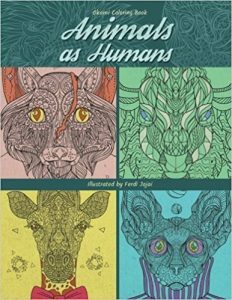 The animals are drawn realistically though some are wearing clothes and are involved in more human type activities. The designs range from cute to pretty and elegant and are a good challenge to color. While I enjoy coloring in detail, this is not a book I would suggest for anyone who has vision or fine motor issues. 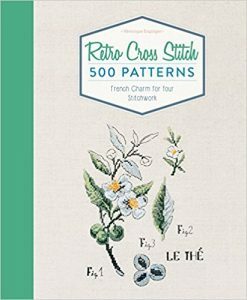 It is a book for individuals who like a bit of a challenge in their projects and who enjoy charming idyllic settings. 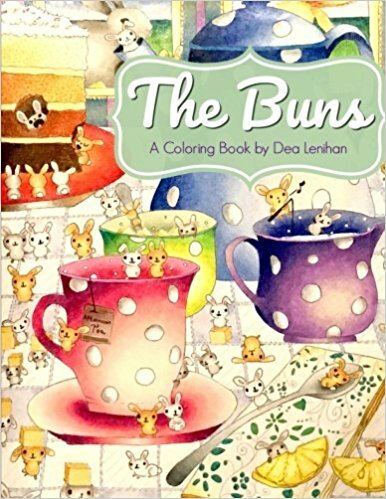 “The Buns” is the first coloring book I have by artist Dea Lenihan. I’m certainly going to look at some of her other books as I think this one is very cute and fun to color. 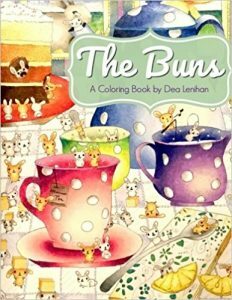 The Buns are little tiny creatures, easily able to fit inside of the bowl of a teaspoon. They seem to be equally at home in a forest, a garden or even inside a house. The first design in the book shows the Buns next to a regular size rabbit so you can get a sense of their size. All in all, there are twenty full page coloring designs with two copies of each page. In addition, there are two pages which tell what the Buns love and what they are afraid of. There are also two pages of labels which you can color and cut out for use with gifts. The designs are detailed as there are full backgrounds and there are a few spots with intricate and smaller areas to color. 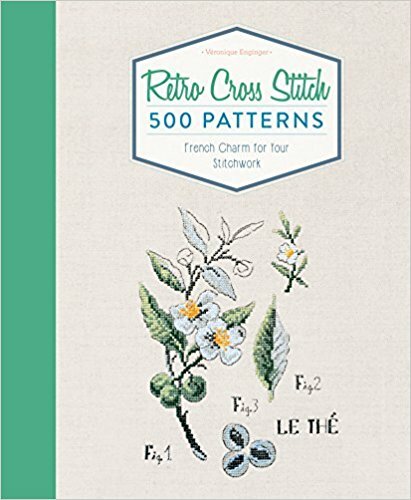 It is not what I consider a difficult book to color but will provide hours of fun for each design. 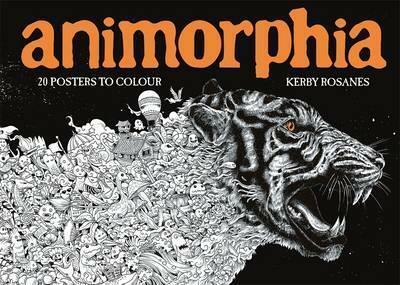 This is a lovely poster edition of Animorphia. I really enjoy Kerby Rosanes artwork and own the original coloring book both in the US and UK edition (the UK one being the better by far when the books were first available. When I found this UK version of the book (set up in what we normally call an artist’s edition), I ordered it right away. While I love the artwork and the format of the new book (thick paper, larger size and perforated pages at the top), what I am not so happy about is the cropping of the designs and the choice of designs included. This really could have been the opportunity to provide the peacock in a way that could be colored (the first one disappeared into the binding of the book) but it was not included. What was included were designs which are chopped at the edges. They still work but it would have been nicer to have the whole design. Perhaps sizing it down would have made it impossible to color. Maybe not. In any case, it was a bit disappointing to me. Notwithstanding that, these pages are ready to frame once you color them and remove them from the book. The book has a nicely illustrated cover and a heavy cardboard backing page which makes it easy to color on a flat surface. 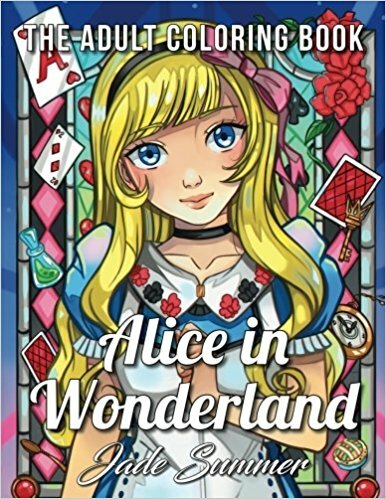 This is the second Alice in Wonderland coloring book published under the imprint Jade Summer. There are a number of artists (and probably groups of artists) who are responsible for the designs under this publishing name. While I enjoy Alice coloring books and collect many of them, I still wish that the publishers had chosen another fairy tale or two before going for the second one of Alice. Having said that, this is a fun Alice. The characters have a manga feel with large eyes and younger faces. The evil characters look a little too nice and happy (hence my detracting half a point.) Part of Alice is having the mean Queen for her to escape from. Because it is a little happy happy, it would make a good coloring book for an child eight and above. I’m included in the “above” range and will have a lot of fun coloring the characters. It’s cute but not my favorite of the Alice books available. The designs are detailed and have full backgrounds. This is a nice change from some of the more recent Jade Summer books which are a little too childish for my taste. There are no intricate and difficult areas to color but finishing the whole of each design will take some time and prolong the fun of coloring in it. Along with the book, you receive the ability to download a copy as well. The contact information (along with access code)for that copy is included in each book. 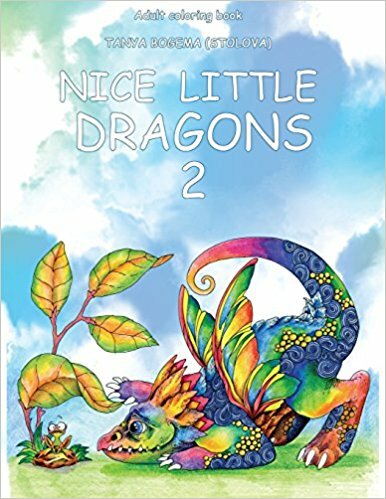 There is an adorable design of a little dragon asleep in his bed, all covered up with his cap on his head and his little stuffed animals scattered about. Another designs shows a little dragon with a birds next in his antlers as he waits impatiently for them to grow and fly away. I must admit my favorite is a little dragon coloring in what looks to be one of the Nice Little Town series designs. While the designs of the dragons themselves have some detail, most of the pages are what I would categorize as fairly easy to color. There is plenty of room to add your own special touches if you wish.